Upon waking this morning I fed the Husband, children, and not myself. Since this lactose intolerant thing started I haven’t been in much of a mood to do so. Normally I would have cereal with milk, toast with butter, glass of milk, etc. One of the above. But lately, without that my options are non-conventional breakfast foods or oatmeal. And after 2 weeks of oatmeal… yeah, so done with that. I fell asleep again, while watching Cars with Duncan while “Her Highness” was doing something or another upstairs. She came down wearing a Sunday dress *fumes* and asked me to tie the sash. I did and then went into the kitchen to retrieve a perfectly good, untouched apple from the sink that Duncan has put there. I washed and sliced it, grabbed the crunchy peanut butter (thank HEAVENS I realized that’s not dairy, lol) from the cupboard and sat down to blog. That was 2 hours and 20 minutes ago. WOW, distraction. The peanut butter was good and I think I needed the protein. I know protein isn’t a vital characteristic of milk but I was so tired, it helped to wake me up. I can’t think, off the top of my head, of any characteristics of Vitamin D loss or calcium loss except for the obvious one of my bones turning into Vegemite. 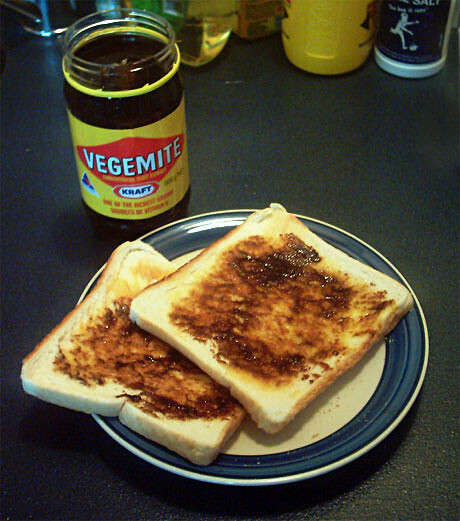 Yes, Vegemite, you know – the Australian wonder owned by the American company, Kraft. My humor has been a wee bit dark lately and it’s been getting the best of me. Sarcasm can take a bite out of someone’s mood if used incorrectly and lately I’m been a bit mouthy. Avoid this by not encouraging me and eliminating contact. Easy enough, right? The children have been an absolute mess this morning, both in awful AWFUL moods since waking early this morning. Liv absolutely lost it when Cam walked out the door screaming that she hadn’t had a “kissy and huggy” to which I had no choice but to tell her too late. He was late to work and she was going to take ten years to get off her chair to get what she wanted. So, really, there was no option and I told her exactly that. I offered to let her call him on my phone so she could send a kissy over the phone, etc. But no go. She then began the huge monologue “Why aren’t you ever nice to me? I just want to say bye to Daddy but you are a mean mommy! Why don’t you make me happy?” If you haven’t noticed, the drama queen has only gotten worse. She’s in tears half the day over the most absurd things and 99% of the time she doesn’t even need another person involved to justify a melt-down. It’s a lovely arrangement. On the bright side, on Saturday we had a very successful shopping trip. Liv wore her very cute new outfit yesterday and yes, I’m awful, I didn’t get any photos. I do have photos of Duncan riding his new bike though, those will come soon. We also got to see the Oscar Mayer Weinermobile or whatever they call it, and we have photos of that. 🙂 Duncan was delighted to see a hot dog 3 times the size of our truck. More later when the kids are occupied.